Enhanced platform unifies the travel ecosystem, bringing new revenue opportunities to airlines by focusing on the complete passenger journey. APEX EXPO, Boston MA | September 24, 2018– Guestlogix, a leading travel technology company that inspires and delivers better journeys, has introduced new platform features that bring unification to today’s fragmented passenger experience. Built around the Traveler and Crew Experience, the new features are an industry first and offer the best of B2B and B2C travel technology, helping airlines and other travel brands streamline products and services for their customers, inflight, through destination and back home. For more information about the company’s travel platform or to speak with Guestlogix President Robin Hopper, please contact Vanessa Horwell at +1.305.749.5342 x 232 or vhorwell@thinkinkpr.com. Guestlogix builds travel technologies that inspire and deliver better journeys. The company was founded over 10 years ago, helping airlines around the world transform the way travellers purchased onboard. Today, Guestlogix provides a comprehensive platform that connects the entire travel ecosystem, giving passengers and crew a go-to app to enhance travel and airlines significant new revenue streams and loyalty opportunities inflight, through destination and back home. The Guestlogix head office is located in Toronto, Canada with skilled teams in the USA and UK who empower over 25 airline and transportation customers across the globe. Visit www.guestlogix.comto learn more. Toronto, Ontario | September 26, 2016– GuestLogix Inc.(“GuestLogix” or the “Company”), the leading global provider of onboard retail and payment technology to the airline and passenger travel industry, announced it has successfully emerged from creditor protection under the Companies’ Creditors Arrangement Act (Canada) (the “CCAA”) under a new ownership group and CEO, Mike Abramsky. With a renewed financial footing and new leadership, GuestLogix is now a viable, debt-free private company with the resources necessary to pursue its growth plans and the continued advancement of its onboard retail technology platform. GuestLogix’ new owners are a Canadian investor group with a strong track record of investing in high-growth technology businesses, and include Stornoway Portfolio Management Inc., Bridgecorp Canada Inc., Logan Peak Capital Inc. and Klass Capital Corporation. GuestLogix’ new CEO, Mike Abramsky, is a global technology leader with a solid track record of leading businesses to sustainable growth, client value and profitability. A seasoned technology executive, for two decades Mike has held leadership positions at Argus Software, Delrina Corp, Xerox and other organizations. Mike was also a Managing Director for RBC Capital Markets. Mike holds a Bachelor and Master of Science in Engineering from Massachusetts Institute of Technology (Boston) and an MBA from Harvard University. Under Mike’s leadership, GuestLogix plans to continue to bring to market innovative, value-added solutions that power the travel industry’s most popular onboard retail offerings – whether in use by thousands of Flight Attendants or via self-service systems such as in-flight entertainment seat back screens and onboard streaming solutions. GuestLogix also powers the retail and ticketing systems of rail operators as well as the world’s largest airport lounge company. GuestLogix currently processes transactions in 144 countries around the world and supports a global client base which in turn serves over 2.4 million travelers daily. Aircraft Interiors (AIX and PEC) is now the biggest show in IFEC each year. It got that way because there was a need for a centralized European and Middle East source of information, communication, demonstration and celebration of the IFEC experience, as well as, being located at the same venue for over ten years. 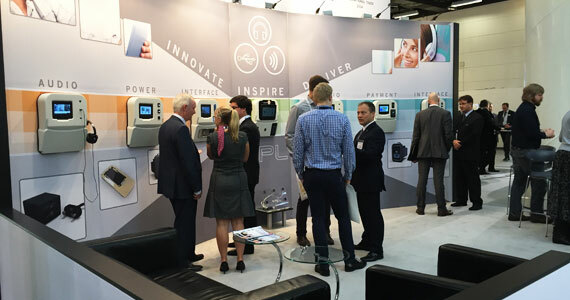 With over 530 exhibitors this year, there was a wealth of innovative products and services on display last week in Hamburg Germany. IFExpress was told that over 16,000 visitors attended the event (Entrance is free – good idea. ), and of course, we covered as many booths that we thought our readers might find both interesting and useful, and that caught our fancy. Obviously, it will take a few weeks to get the story of our visits out so stay tuned on that front. Pictures will be on the website soon so keep watch there as well. In case you did not go, there are a couple things about the show you should know. First, the expo consists of two parts – the first day (Monday) is comprised of a Passenger Experience Conference. It is a one-day inflight data extravaganza and covers almost every facet of the inflight experience with lectures, small meeting/discussion forums, and culminates in a useful food and beverage entertainment party. The next 3 days are dedicated to the exhibition show with over 530 exhibitors. One of the best part of the flying future is the potential for onboard purchases, as many speakers at the Passenger Experience Conference (PEC) meeting on Monday stated. One presenter noted that the folks at GuestLogix pegged onboard sales in 2014 around $1.8B worldwide. Beverages were 58% of the total, food was 38.2%, while “Passenger Comfort” was given at 3.8%. The interesting part was the growth – 11% per year! Part of this is attributable to the airlines reduction of free items; however, this kind of growth is indicative of a couple things. First, passengers have money to purchase items, that is proof of the growth rate, but further, as an area of purchasing potential, the cabin is ripe. Thus, there is a growing market for providing a way to purchase more on the plane is an obvious potential. We should also mention that Visa and MasterCard also exhibited 10 and 13.6 % growth, respectively, in the same period. Further, off-line limits are in the $100 to $200 range, while on-line sales via the credit card world has no limits. The authentication process is delivering real-time proof-of-ownership status with the bank that issues the card (and a real-time Lost/Stolen card status as well). Obviously, connectivity and credit card sales onboard have a future on aircraft and folks like IFPL are prepping the technology for that eventuality. One of the early show surprises was the involvement of Google with IFEC and we can thank Joe Leader of APEX for their inclusion. By using their world class data aggregation and knowledge data base capability, the folks at Google see a connection to this business in the pre-flight, in-flight, and the post-flight regimes by helping to extend the engagement window and shortening the rebooking cycle. In flight, they see the capacity of helping the connected passenger to experience a better, personalized experience, and finally, enabling ancillary revenue growth for products and post flight services. Google has a part in the future of air travel… they think so and so does APEX. On the same note, Joe Leader of APEX, see’s a world of data assisted passenger experiences and kicked off their announcement of an Official Airline Rating program. Beginning with seats and product catalogs, the APEX view talks about high effectiveness and high airline control over the eventual personalization of the travel experience and the resulting “differentiated” airline in the evolution process. Of course, the issue is data and while passengers (74% on average) are comfortable using technology when they travel, there is a plethora of apps available, fewer are really used. He noted that an average of 80 are device installed, only 25% are seemingly used for the travel process. While the numbers may be higher than you or I use, the issue is one of data obfuscation – too many apps, and a better way to use them is needed. In the next few years as Joe noted, there will need to be an interoperability between apps, Facebook, and Google. There also needs to be a friendlier branding eco-structure in the ticket process… and thus there needs to be a neutral party to pull the process together. In essence, he sees a future airline rating system that can know and confirm validity for all airlines (Tall order!). Next, it has to be useful to passengers beyond travel and since there are over 10 million active users, this tool has value. Further, the tool that Joe is proposing has to correctly use feedback and exhibit some neutral bias such as a non-profit position because it has to provide non-conflicting results to the airlines. Thus, he proposed OfficialAirlineRatings (TM) (patent pending), which will be validated flight ratings for worldwide airlines by the passengers… this is a global project. He expects the data service to begin this summer and time will tell if airlines will get in bed with this passenger response driven system. From a data point of view, APEX plans to analyze subjective data from passengers, use objective data captured from actual sources like seat measurements and IFE capability and availability. We expect APEX to calibrate and review the data and sources by flying the airline noted routes (hopefully announced), and provide raw data and awards as the final output for the effort. Make no mistake, this is no easy challenge because the airline involvement is key and we will wait to see if APEX can corral the airlines into this program – lofty goal, hard to do in practice. IFExpress wishes APEX the best on this program because it establishes a common goal for measurement but historically, this has been hard to achieve. AIRBUS’ launch customer for the Airspace by Airbus cabin is TAP Portugal’s 14 A330-900neos. The new Airspace by Airbus has a LED mood lighting system, larger overhead bins, new lavatories, a new welcome area and the latest innovations in IFE and connectivity. SINGAPORE AIRLINES selected STELIA AEROSPACE, to design and manufacture their new business class seats. ROCKWELL COLLINS and THALES were selected by Airbus to supply high-bandwidth connectivity (HBC) solution for A320s, A330s and A380s; companies will collaborate with Airbus to develop and deploy line-fit and retrofit systems. Hainan Airlines selected THALES to supply Android-based AVANT IFE for its new A330s. Deliveries start in the second half of 2017. PANASONIC AVIONICS eXO overhead IFE system was selected by Saudi Arabian Airlines for 30 A320s currently on order. STG AEROSPACE launched new saf-Tglo blu photoluminescent floor path system that uses a cool blue glow instead of the traditional green glow, and liTeMood LED a newplug-and-play replacement for incandescent reading lights on the 737NGs. They also secured Design Organisation Approval (DOA) from EASA. Additionally, STG Aerospace expands its emergency and informational cabin signage product range with Malaysia Airlines. Lastly, Eastern Airlines improves passenger experience by installing STG Aerospace’s LED mood lighting system. Summit selected TELEFONIX PDT to secure STC for its IFEC hardware for 737-700/800/900ER. HAMBURG AVIATION presented 2016 Crystal Cabin Awards to B/E AEROSPACE (Cabin Systems), BOEING (Greener Cabin, Health, Safety and Environment), ETIHAD(Cabin Concepts), LUFTHANSA SYSTEMS (Electronic Systems), REBEL.AERO (Passenger Comfort Hardware), SEKISUI SPI (Material and Components), TU DELFT (University) and ZODIAC(Visionary Concepts). AFI KLM E&M received an EASA STC to install ROCKWELL COLLINS PAVES PSS on A330. GORE unveiled HDMI 2.0 cables to provide higher video resolution for IFE systems. GOGO released: From the Ground Up: How the Internet of Things will Give Rise to Connected Aviation, which was created to spark an industry wide conversation about how the Internet of Things will reshape aviation. Free Also, GOGO partnered with Airbus Corporate Jet Centre to install 2Ku technology on new A350 aircraft. Delta Air Lines will take delivery of 2Ku-equipped A350s in 2017. FOKKER SERVICES displayed iShade dimmable technology integrated into its new panoramic window at AIX. INMARSAT to enhance airline passenger broadband offering with roadmap for aviation capacity growth. Global Xpress will serve as the foundation of an integrated global network that can be shaped to fit any airline route system and built upon to meet future demand. INFLIGHT DUBLIN strikes worldwide IFE agreement with Sony Music. DMD (Dawson Media Direct) welcomes digital media expert Andrew Wiltshire to head Digiredoo their digital newspaper and magazine delivery service to airlines independent airport lounges and major rail operators across the world. MEZZOGLOBAL launched low cost wireless In-Flight Passenger Entertainment App for Bring Your Own Devices (BYOD). PANASONIC AVIONICS is first to offer NFC Technology with multiple aircraft OEMs. ASTRONICS CORPORATION awarded Emergency Lighting and Passenger Service Unites (PSU) contract for the Embraer E2 program. SITA released that Australia Border Exit Checks are now powered by SITA’s advanced technology. Automatic advance security checks now being run on all passengers exiting Australia. Lastly, we apologize to those folks we missed at AIX. We tried but it has finally come down to time versus the number of IFEC displays and presentations. If you have something you want to say, send it to us and we will get your message out… we hope! 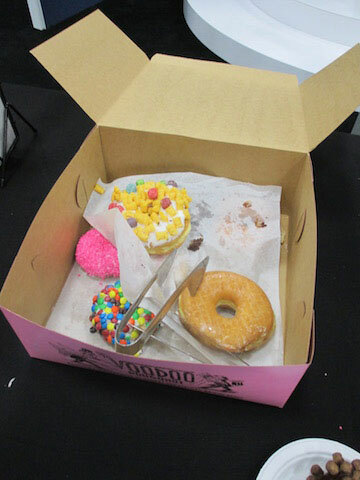 APEX EXPO, Portland, Oregon: First Day and More! Portland Oregon was a great place to hold the recent APEX annual IFEC soiree and IFExpress will deliver a few product summaries in this and the next IFExpress. We plan then to feature in-depth stories about what we saw… and we saw a lot. From a general observational note, the show looked to us as the beginning of an industry and technical turn-a-round. From a technology point of view, the inflight world is changing and new technology is partly responsible. Technology developed for products on the ground, and in the air, is very exciting to us and we will discuss and promote that change as best we can. The other part of the change we observed is you, our readers. The issue here is the attitude of the vendors and airlines. While the melding of ground-based and airborne technology is of great interest, the fact that a whole lot of people are now seeing the journey as a issue, not just the flight itself – the “experience”. How can you not be excited about that? We also want to be sure to say “Thank You” to our clients, advertisers, and all our industry associates – if it weren’t for you, we would not be in business. We apologize for asking so many questions and taking up your valuable time, but we have only one goal – technical truth. Stay Tuned! First, the Show: “2750 Registrants from 51 Countries, and 207 exhibitors,” so noted new APEX CEO, Joe Leader. The IFEC event in Portland, Oregon this year clearly set out a new vision for the APEX team that now extensively focuses on the “experience” value of IFEC. This is a concept that is being heralded by more organizations as the new trip vision. The “Experience” tag line was noticed in print, on slides, and voiced by almost every show attendant. As noted by Mr. Leader, “We do not take a trip, the trip takes us.” – and there could just be some truth in this observation. Certainly, if travel gets difficult, as it often does, travelers do get an experience but it is frequently negative. When it does become a positive event, as many noted, it will result in a good experience. And, the APEX team see’s their job as helping to facilitate solutions throughout our industry. Importantly, this positive experience includes a lot more than tickets, inflight movies, or food… a lot more. It includes the flight of course, but one can rationalize that the process of finding a destination, buying a ticket, waiting at the airport, interacting with airline personnel, getting one’s baggage… and so on, are all part of the trip; consequently, IFEC organizations and airlines are focusing on the “experience” moniker, and that is what this show is, and will be about, for some time to come. As a result, we detected a big change in the air this year and only time will tell if the IFEC crowd gets the message and forces change positively. Readers, this is a big deal so we hope you get on board with the concept. Last year alone, the airlines had $29.3B in profits, and that exceeds the previous year’s record of $16.4B. Many travelers say it could be that airline revenues are potentially inverse to joy of the experience… and thus there is a opportunity for the mechanics of change here. One way or another, experiences are being made for more and more customers and APEX now is in the thick of the change surrounding this growth. This ought to get interesting! We should also say a few words about Joe Leader since we met and talked extensively with him. Joe is one of the most positive humans on the earth – that is a big deal. Why? Because if the new APEX mantra embraces positivism, the boss better be… and as far as we can tell, he is very positive. We asked a few show-goers what they thought and perhaps one discussion with a board member put it best. Michael Childers – APEX Board Member and Tech Committee Chair had this to say: “I think this APEX marks a new direction for this Association with the addition of Joe Leader as APEX CEO. With a full time executive working exclusively for APEX, and one who is technology savvy, we can do things we could not do before. I’m looking forward to working with Joe and with our Technical Director Bryan Rusenko to take technology to a new level of implementation.” So if you meet Joe, and you most certainly will, don’t be put off with the man’s ability to look at the good side of things. We had a few questions about the number of increasingly related meetings and groups that were overtly “experience” focused, and even some competitively so. His answers distanced his position from any competitive posture. Rather, he embraced the common focus and resultant teaming value as a beneficial result of multiple groups seeking a common goal or solution – a solution for a good trip “experience” and a future for many more of them. GuestLogix: Craig Proud – SVP Platform of GuestLogix told us that purchase trends in consumer behavior included digital wallets, self-service retailing, and cashless & paperless payments. Further, he noted the global mobile payment forecast is growing some 30% per year. And if you don’t think some of that growth won’t happen on airplanes, ask yourself if you ever bought anything on a plane with a credit card and then note what you have done on the ground over wi-fi. This may also help generate drivers for inflight Wi-Fi. Hello Amazon Inflight! The folks at Lumexis told us that they announced an order for 8 B737 FTTS + Screen systems from Caribbean Airlines. Also, they now are the first IFE company to implement the Android Lollipop OS. We think there a few more announcements coming soon too and we see more browser solutions in their future. Panasonic, the Big Dog in the industry with over $2B in IFEC sales last year, had a ‘banner winning’ at the Pax Choice event. All 5 airline winners in the 13 “Best of..” award categories were using Panasonic hardware (Emirates won 7 of the 13 categories). 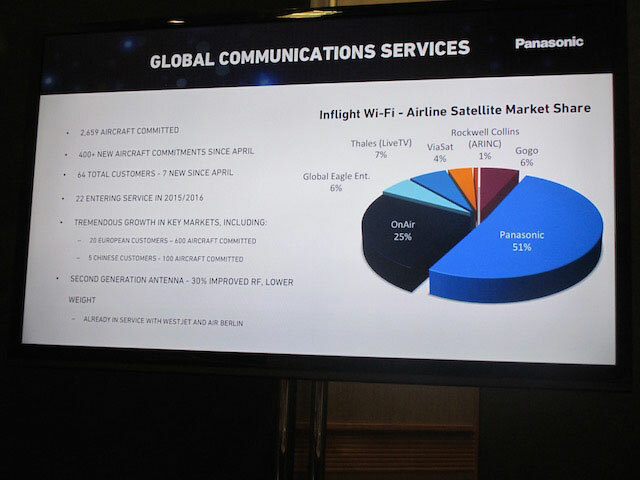 Further, some 516 aircraft have Panasonic installed connectivity since April of this year with 400 more committed for wi-fi since the Hamburg IFEC show. This chart tells the story! 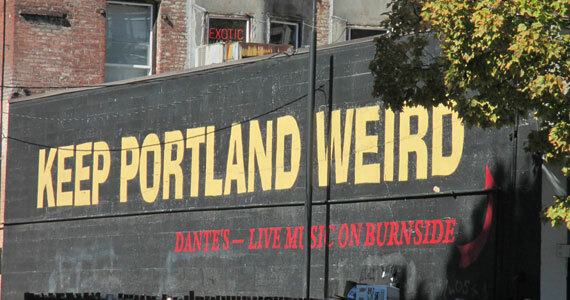 We would love to talk about their industry party with the Portland food trucks but… More later! BOSE is always a fun visit and we proved that the lightweight 20i portable headphones really make the world of inflight listening very similar to that with the fixed cups. Now, if they would just remove the wires and include a Bluetooth… sorry, we can’t say that! Telephonix + PDT: The company highlighted the Summit Product Line of (IFEC) equipment for the show and we finally got a hands-on session. The Telefonix Summit line is comprised of state-of-the-art system components designed to enable unique and innovative in-flight connectivity and entertainment solutions. 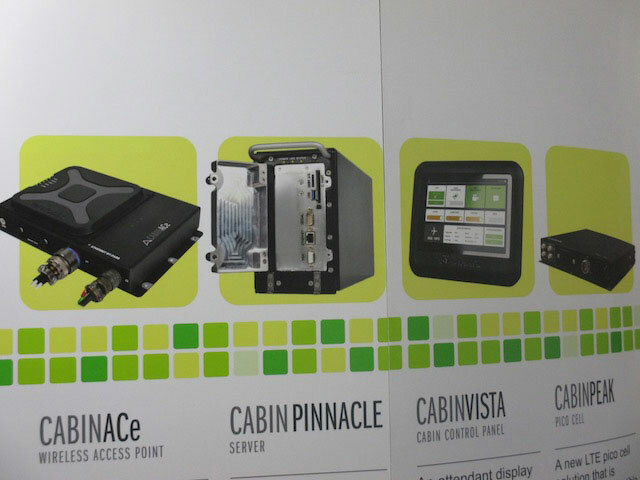 Here are the hardware elements: Cabin ACe Wireless Access Point (WAP), Cabin Pinnacle general purpose airborne server, Cabin Peak pico cell, and Cabin Vista attendant display can be added to enhance existing in-flight entertainment systems or combined to create a unique IFEC solution. More on this later, but in the meantime you might want to read this link… the security stuff intrigued us! 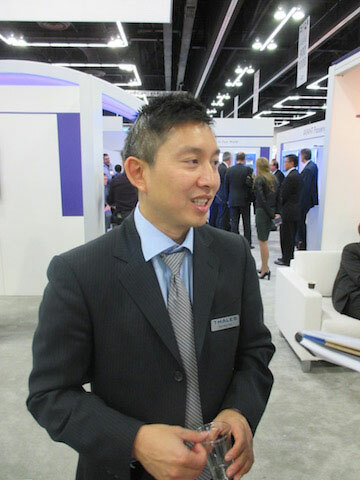 Thales: During an interview with Duc Huy Tran, new VP of Strategy and Marketing, he told IFExpress: “If an airline doesn’t have streaming video, they will have disappointed passengers, and if they don’t have a big enough data pipe they can’t cover the needs… but it has to be cost effective,” he said. “Devices will grow tenfold in the 10 years and the passengers want to be there.” He also told IFExpress “There is a trend toward two-way engagement, not just entertainment,” but he noted, “The more you engage, the more you can monetize,” and that tells the story of the connected aircraft and where this is all going! The folks at Gogo are pretty B to B focused and as you might guess, they mostly talk to airlines and partners and this accounts for their Crew Connect and Voice tech apps. “It has noise canceling capability in it,” noted Steve Nolan. IFExpress asked about the 2Ku status, and he said; “We are most excited about 2Ku based on the performance we we have seen to date – we are also excited about bringing more bandwidth to the aviation market.” We will have more on this as many folks were talking about their 2Ku system. 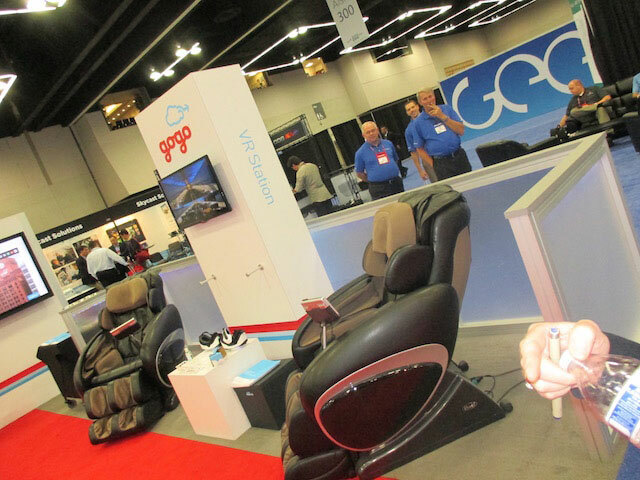 Visiting Gogo is always a tech trip… and this year they were one of the 5 or so booths that featured some Beacon technology. Further, they also showed robots, 3D printing and the best airplane seats ever… just kidding, they were vibrating massage chairs… with screens. Lufthansa Systems BoardConnect – What you will see in the link below is one of the early shots of one of the more amazing things to be taken aboard an airplane. Amazing because it delivers streaming Wi-Fi to 50 passengers in approximately 1 Mbps streams, and runs on batteries (or fixed power)! It is about the size of a large book and it works by just turning the device on and placing it in a baggage bin for operation. 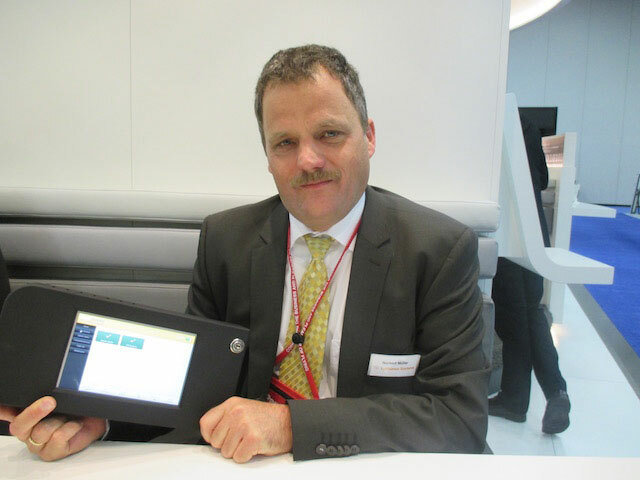 “Much like your own streaming server, it uses no outside access points and the system is a faction the cost of an installed IFE system,” noted Norbert Müller, Senior Vice President BoardConnect at Lufthansa Systems. “… and the SSD storage holds a lot of movie choices as well.” Here is a picture of the device and we will have more on this one later. We will have a lot more hot gadgets and stories about them, and yes, more data in the coming months, so if we ran out of room for your story in this issue, be patient! Stay Tuned! Hamburg, Germany | April 11, 2014– Ancillary Revenue represents a $46bn industry for the global commercial air transport sector. At present these revenues are experiencing a 30% year on year growth. Thales expects that the on-board portion of this revenue, which today accounts for 15% of the total, will become an ever more crucial driver for airline profits. The IFE leader is therefore announcing the delivery of its onboard payment application that brings self-service to the air by enabling passengers to purchase items directly through the TopSeries AVANT system. The system platform is now compliant with the PCI Data Security Standards (DSS) and will fly onboard a major carrier in Q2 2014. By bundling many different payment methodologies into a single package, Thales aims at enhancing the passenger experience whilst at the same time enabling airlines to further their ancillary revenue generation streams. The application, developed by GuestLogix, allows for greater flexibility and ease of access to payment options for passengers, all linked to the easy to use credit card reader equipped on AVANT. This functionality opens the doors to a vast array of pay-for services including shopping for destination items such as ground transportation, tourist attraction packages and selected store catalogue shopping, as well as on-board shopping from duty free to in-flight entertainment access or inflight catering for airlines that do not offer these as a complementary service. Toronto, ON | March 10, 2014– GuestLogix Inc. (TSX: GXI), the leading global provider of onboard retail and payment technology solutions to airlines and the passenger travel industry, today announced an agreement with Global Eagle Entertainment Inc. (Nasdaq: ENT), the leading full service provider of content and connectivity to the worldwide airline industry, to incorporate its OnTouch® Merchandising Platform into Global Eagle Entertainment’s inflight entertainment and connectivity (IFEC) portal. With this agreement, Global Eagle Entertainment’s airline customers will be able to sell destination-based activities, including GuestLogix’ OnTouch® Ground Connections and OnTouch® Box Office for transportation and attraction vouchers via its WiFi IFEC portal. Global Eagle Entertainment’s portal is accessible via passengers’ WiFi-enabled electronic devices such as smartphones and tablets, extending the onboard shopping opportunity throughout the duration of the flight. A joint deployment has already been secured with an airline customer, and GuestLogix is poised to deploy across additional current and prospective Global Eagle Entertainment customers. By partnering with GuestLogix, Global Eagle Entertainment is able to deliver an enhanced selection of destination-based merchandise through its passenger portal. Among the products and services passengers will be able to access are airport transfers via OnTouch® Ground Connections and passes to local theme parks and attractions through the OnTouch® Box Office. Global Eagle Entertainment’s global customer base includes more than 150 airlines worldwide. Toronto, Ontario, Canada | January 30, 2014– GuestLogix, Inc., the leading global provider of onboard retail and payment technology solutions to airlines and the passenger travel industry, today announced it has partnered with full service merchant processing provider, KUBRA. With this new agreement, KUBRA will expand GuestLogix’ Global Payment Gateway network and provide payment processing infrastructure support to enable payment authorization and settlement transactions in both online/offline and real-time environments. KUBRA is well-positioned to support GuestLogix’ global customer base, with coverage in North America, Asia Pacific, the Middle East and Europe. This partnership with KUBRA will assist GuestLogix in meeting its ongoing commitment to providing comprehensive and innovative payment solutions, and to building a strong network of partners to best support its customer base and the passenger travel industry. GuestLogix Inc.(TSX: GXI), the leading global provider of onboard retail and payment technology solutions to airlines and the passenger travel industry, today announced that it has signed a ten-year agreement with NCR Corporation (NYSE: NCR), the global leader in consumer transaction technologies. The purpose of the relationship is to significantly improve the way travelers are able to conduct transactions through self-service airport kiosks and mobile applications. NCR and GuestLogix will help airlines, which are increasingly focused on driving ancillary revenue, by facilitating transaction processing. The relationship provides a comprehensive, secure and compliant means for airlines to sell additional products and services at multiple touch points throughout the travel journey, improving the passenger experience. Self-service technologies are now pervasive and are in fact becoming the preferred means of transacting in the average consumer’s daily life. According to a worldwide consumer survey released in June 2013, Cisco Customer Experience Report, 52 percent of consumers said that they prefer self-checkout stations in order to avoid waiting in lines and 61 percent of consumers said they would shop at a fully automated self-service store1. In April of 2013, NCR released the results of its annual NCR Traveler Experience Survey, which revealed that 51 percent of travelers would be willing to pay a nominal fee at a gate-side kiosk for priority boarding to avoid having to check any bags at the last minute2. It also revealed that 77 percent of travelers experiencing cancellations and delays would like the option to bypass agent assistance and book their own alternate flights using a kiosk or mobile device3. NCR Travel is building on a 130 year history in retailing by focusing on cutting-edge retail and self-service technologies that ease the travel experience for passengers and increase revenue potential for travel providers. NCR Travel delivers a range of self-service technologies to airlines and other travel operators from Latin America to China, and everywhere in between. NCR uniquely supports a global retail marketplace solution, allowing travel providers to manage a much more personal, seamless ancillary shopping experience through a single, comprehensive technology platform at all points in the traveler lifecycle. As part of this agreement, GuestLogix brings 38 payment certifications and more than 40 operational certifications, both from a global and regional perspective, to ensure secure, compliant payment processing. According to IdeaWorks, airline ancillary revenue represents a more than $36 billion opportunity per annum. The world’s top 100 airports represent a cumulative opportunity of more than 1.15 billion annual enplaned passengers that either currently use mobile or kiosk technology to check-in or spend more than one hour at the gate allowing for ample time to access ancillary offerings via self-service kiosks. This number is estimated to grow more than 50% over the next three to five years. The top 100 airports have approximately 7,500 gates in total. GuestLogix and NCR believe that this solution will easily extend to rail and bus operators as well. GuestLogix will integrate its Transaction Processing Engine® (TPE®) into NCR Travel’s traditional point-of-sale and self-service software and hardware technologies. Known for its leadership in the onboard retail environment, GuestLogix believes that this extension to support ancillary revenue transaction processing at additional touch points in the travel journey supports a much larger vision. Toronto, ON | October 21, 2013– GuestLogix Inc.(TSX: GXI), the leading global provider of onboard retail and payment technology solutions to airlines and the passenger travel industry, today announced that it has signed a ten-year agreement with NCR Corporation (NYSE: NCR), the global leader in consumer transaction technologies. The purpose of the relationship is to significantly improve the way travelers are able to conduct transactions through self-service airport kiosks and mobile applications. Hamburg, Germany | April 10, 2013– Panasonic Avionics Corporation (Panasonic), the world leader in in-flight entertainment and communications (IFEC), today announced the latest enhancement to its Global Communications Service – the eCommerce Partnership Program. The program can be pre-integrated into an in-flight Wi-Fi portal, and is available without obligation for Panasonics’ Global Communications Service customers. There are currently three vendors who have signed a Memorandum of Understanding (MOU) in order to participate in the program. TripAdvisor®, who has been long perceived as the hub of travel information and research, will provide a streamlined version of its site to passengers with content that can be airline or route driven. Passengers will have access to up-to-date information such as points of interest, location details, photographs, menus, user reviews and special offers — everything about where to stay, where to eat, and what to see. Also participating in the Panasonic’s eCommerce Partnership Program is GuestLogix™, who is already a partner with Panasonic for payment processing infrastructure. The company will offer its OnTouch™ product portfolio, which includes transportation booking, event tickets, shopping catalogs and concierge services. In addition, Choose Digital will provide an online marketplace with digital goods such as ebooks, audiobooks and music. Airlines will be able to customize the content categories and offer items for as little as $1.00 USD for purchase. Browsing through the catalog, passengers will find the latest titles and albums available, and be able to listen to sample snippets of audio content before making a purchase. Panasonic will continue to work with prospective partners to expand this program and offer airlines a wide variety of eCommerce options. Inflight Retail, Connectivity and More! Panasonic to a similar deal that makes the global payment company the Big Dog in the industry! GuestLogix will integrate and license its Transaction Processing Engine via Thales onboard IFEC systems to many of the world’s leading airlines. The software will capture payment information, transfer the information to an onboard server and securely transmit the data to the ground. The payment engine (software) meets the most stringent Payment Card Industry (PCI) validation as a payment application, and all ongoing maintenance will be handled by GuestLogix over the duration of the 10-year agreement. Interestingly, the ability to use fraudulent credit cards is on the increase and some circles peg the losses at 3% of sales, but it might be bigger. We note that the GuestLogix folks have a lot to say about credit card authorization and you can read about it here. Note that TPE will support both live and cached transactions at the seatback screen for items such as Pay per Access, onboard shopping and meals. No information was mentioned about duty-free, we note. 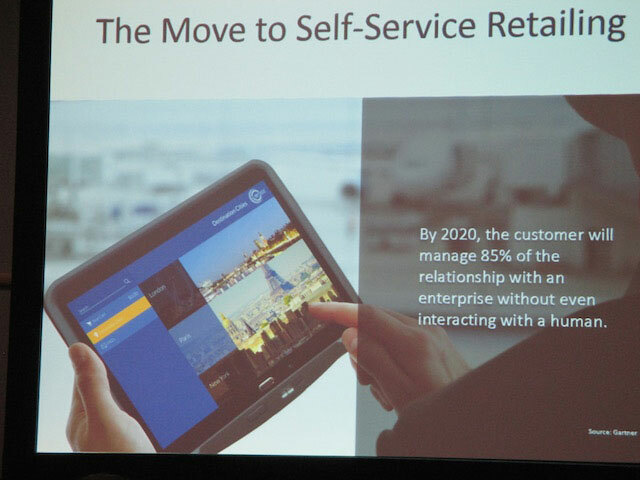 Through the company’s technology, airlines can open virtual stores in the sky that operate in a self-service model. For passengers, this means the convenience of purchasing entertainment, duty-free items, destination-related content (think theme park tickets and passes for events, concerts and local attractions), and food and beverage directly from their seats without having to order thru a flight attendant. For the airlines, this allows retailing to occur throughout the entire duration of a flight rather than a limited time when the Flight Attendant walks the aisle. “For the world’s airlines struggling to justify their costly IFE systems, this means the ability to offer passengers a much broader selection of content that can be immediately monetized, and streamlining their onboard operations to increase sales and ancillary revenues through their IFE systems,” noted GuestLogix CEO, Brett Proud. He estimates the deal will generate USD$350-500 million for the company over the next ten years, through a combination of software licensing and recurring transaction fee revenues. And that’s minor compared to what he believes the airlines could capture if they began to harness the power of retailing through these systems. IFExpress: Regarding real-time processing of inflight duty-free purchases, how is payment validation made prior to a flight arriving at a destination? Is the validation/verification process the same as payments for BOB/non-inventory items? IFExpress: Does merchandise/content available though the onboard store vary from airline brand and aircraft? IFExpress: How is the merchandise “catalog” uploaded to the onboard store in an aircraft? If you are looking to dig deeper, check out GuestLogix’ CEO as he discussed on Business News Network’s The Close, airlines must become global retailers in order to survive. IFExpress got wind of a new development at Gogo so we traced down a story on a new development called Gogo Text and Gogo Talk that you should see at next week’s AIX Hamburg. It seems the folks with slide rules in the connectivity providers’ back room have developed a clever twist on voice and texting from the airplane, over their system. As you might remember, the Gogo system talks to passenger Wi-Fi equipped devices via their onboard server. By communicating to the ground via terrestrial VHF or via satellite, your email message enters the ground-based communication network via the Internet and with the aid of telcos and communication providers. Now, lets go back to the airplane. What if you were to load an Android or iPhone application that figured out that you wanted to text message a person on the ground, and after a proper “handshake” with the onboard server, sent the text message over Wi-Fi on the plane but when it hit the ground it followed the telco route to your friend’s phone or tablet. We note that if the plane was a business jet, it could be voice to text because of existing regulations. This clever technology is being Skype to VOIP but when the folks at Gogo work out the details with their partners (telcos, airlines, biz jet operators) you can expect to use text messaging on your next Gogo equipped flight. Yes, you can get a Gogo app today but that just gets you on to email quicker on the plane. Let’s face it readers, text messaging has been a long time coming to Gogo equipped planes, but it has been available where the picocell GSM solutions have lived for some time. Interestingly, you will be able to see those text charges on your phone bill. Cool! Toronto, ONT | March 11, 2013– GuestLogix Inc. (TSX: GXI), the leading global provider of onboard retail and payment technology solutions to airlines and the passenger travel industry, today announced that it has partnered with global technology leader and major in-flight entertainment and connectivity (IFEC) provider, Thales. The partnership involves the integration of GuestLogix’ Transaction Processing Engine (TPE) into Thales’ TopSeries® IFEC systems, enabling payment acceptance via state-of-the-art seatback screens. Implementation of the joint solution will commence immediately, and Thales’ customer-base will use the GuestLogix system for onboard payments without any need to retrofit hardware. GuestLogix’ Transaction Processing Engine was designed and developed for the secure capture and processing of payments through a variety of access points. By integrating GuestLogix’ technology, Thales has expanded its popular IFEC systems into seat-centric storefronts, benefiting its airline customers and their passengers, while also maintaining its status as a leader in aircraft innovations. The incorporation of GuestLogix’ TPE into these seatbacks marks a first for GuestLogix and further strengthens the Company’s position in the market. GuestLogix will integrate and license its Transaction Processing Engine via Thales onboard IFEC systems to many of the world’s leading airlines. The software will capture payment information, transfer the information to an onboard server and securely transmit the data to the ground. The GuestLogix Transaction Processing Engine (TPE) meets the most stringent Payment Card Industry (PCI) validation as a payment application, and all ongoing maintenance will be handled by GuestLogix over the duration of the 10-year agreement. The TPE will support both live and cached transactions at the seatback screen for items such as Pay per Access, onboard shopping and meals. GuestLogix and Thales anticipate rollout to begin July 2013. A joint deployment is currently underway onboard a first major airline customer. Toronto, ON | September 18, 2012– In a move to further deliver new ancillary revenue streams to the world’s leading airlines, GuestLogix Inc. (TSX: GXI), the leading global provider of onboard retail and payment technology solutions to airlines and the passenger travel industry, today announces a global partnership with the world’s leading supplier of in-flight entertainment and communication (IFEC) systems, Panasonic Avionics Corporation. The partnership will immediately enable fully certified payment processing capabilities through Panasonic’s world-class IFE systems, turning hundreds of thousands of seatback screens into revenue-generating storefronts. The new joint solution is now available for all of Panasonic’s customers whether in North America, Latin America, Europe, the Middle East, Africa, Asia or Oceania. Due to the extensive reach of Panasonic’s global customer network, GuestLogix’ Global Payment Gateway was chosen to enable Panasonic to plug into a single gateway for payment processing in any region, using any payment method and with all necessary payment certifications already in place. As the industry’s most selected and installed in-flight entertainment system, the new agreement stands to further augment the value of Panasonic’s IFEC systems. With this new partnership, airlines will be able to significantly enhance passenger experience while at the same time monetize new onboard services to drive additional ancillary revenue streams. According to a recent IBM Institute of Business Value Study, 86% of global consumers desired using a form of technology themselves when shopping . Giving consumers the opportunity to browse through products, initiate the checkout process and ultimately transact purchases onboard themselves, eases the workload on flight attendants and also aligns directly with the growing trend of self-service retailing on the ground. Panasonic IFEC systems then connect to GuestLogix’ Global Payment Gateway to process all payments on behalf of the airline. The announcement of this partnership marks the first of its kind on a global scale and is designed for rapid implementation with all necessary integrations to GuestLogix’ Global Payment Gateway already in place. ORONTO, ONTARIO, Jul 14, 2011 (MARKETWIRE via COMTEX) — GuestLogix Inc. CA:GXI +3.18% (“GuestLogix” or the “Company”), the leading transaction processor of ancillary revenues and the provider of onboard store technology to airlines and the passenger travel industry, today announced its financial and operational results for the three- and six-month periods ended May 31, 2011. All amounts are reported in Canadian dollars unless otherwise stated. DANBURY, CT – February 12, 2010 – JETERA™, the leading provider of targeted ads to travelers using its Precision Ad Network, and partner GuestLogix (TSX-V: GXI), the leading provider of onboard store technology to airlines, today announced the availability of OnTouch™ Ads, an innovative advertising service designed to unlock the potential of targeted, destination-based advertising to airline passengers and help airlines expand their non-ticket revenues. The OnTouch™ Ads service will soon roll out with leading U.S. carriers using the GuestLogix Onboard Retail Solution™. GuestLogix will print advertisements on receipts issued from its POS handhelds. The destination-based advertisements will feature valuable offers related to the passenger’s various attributes and their travel itinerary. The long-term roll out will include the integration of the new advertising service from GuestLogix with other OnTouch™ services deployed on travelers’ mobile devices, including smartphones. OnTouch™ Ads is powered by JETERA’s patent-pending, scalable targeting system. It enables GuestLogix to print advertisements on transaction receipts that are specifically targeted at the passenger making the purchase to enhance their overall travel experience. JETERA’s system combines future travel reservation data with publicly available demographic and preference data to generate rich customer profiles. Using unique pricing-model segmentation and combining it with proprietary analytics, JETERA™ is able to place each traveler into well-defined marketing groups. This enables marketers to select the best prospects, and align their messages with the people most likely to buy their products and services. are timely, relevant and actionable. As a result, these offers will enhance her journey and the airline will benefit from a new source of revenue and develop a deeper relationship with the customer by providing greater value through worthwhile ads. Financial analysts suggest that a typical large airline today can generate at least USD $20 million in ancillary revenue annually by permitting third-parties to advertise to their passengers. OnTouch™ Ads introduces a new way for companies to reach out to the traveling public, holding the promise to further grow airline third-party advertising ancillary revenue streams. GuestLogix has an extensive reach, with more than 20,000 mobile GuestLogix POS devices today, serving nearly 800 million passenger trips annually, with the longer-term plan of extending its reach, and therefore OnTouch™ Ads’ reach to potentially millions of personal mobile devices that travelers carry with them. Mobilein.com predicts that mobile advertising and marketing in Europe and the U.S. alone could grow to over USD $30 billion by 2014.